At his suburban Augusta, GA, practice, Dr. Chen specializes in eyelid surgery for both men and women. During the facial aging process, excess skin or hooding develops on the upper eyelids. In the lower eyelids, puffiness or bags form. While addressing these issues in men is very similar to addressing these concerns in women, there are special considerations that must be taken into account to create a natural-appearing male result. Men considering eyelid surgery travel from Atlanta and even Columbia and Charleston, SC, to our Evans, GA practice to have Dr. Chen perform the procedure. Request a consultation with Dr. Chen using the online form, or call our office at (706) 210-2625 to schedule an appointment. In upper eyelid surgery in men, the excess skin is removed to address the hooding, similar to women. However, men appear more natural with a small amount of excess skin. Too much skin removal, in addition to dry eye problems, may appear very operated-appearing. In addition, fat removal to address puffiness of the upper eyelids should also be conservative. Too much skin and fat removal in the upper eyelids for men can create a hollow-appearing eye that can look feminine. As a result, a conservative approach is key to a natural-appearing result for men. In the lower eyelids, the surgical approach for men is also very similar to women, in which the goal is to address the puffiness or bags that have formed over time. 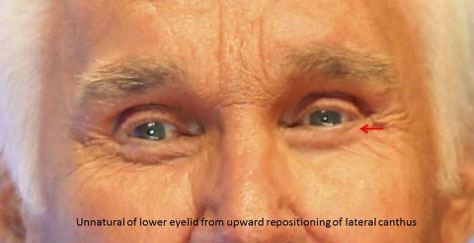 In some situations, the lateral or outside attachment point of the lower eyelid — called the lateral canthus — is repositioned during lower eyelid surgery. The result is a change in the position of the lower eyelid margin that can create a “cat eye” appearance. While this may appear acceptable or even desirable in female lower eyelid surgery, this creates a very unnatural appearance and even feminine appearance in men (red arrow in photo below). As a result, the lateral attachment of the eyelid should be left in its natural position during lower eyelid surgery in men. As a whole, upper and lower eyelid surgery in men is very similar to women; however, a conservative approach to skin and fat removal will maintain masculine features and create the most aesthetically desirable results in men. Read more about upper eyelid surgery and lower eyelid surgery.